Everything you need to know about organization chart and how to create it. Use a great tool to make the best org chart in the fastest way. An organization chart is a simple, graphical representation of the clerk in your company (or other organization) and the relationships between them. It can also be referred to as organigram or organizational chart. Organization structure determines enterprise communication, and the executive and managerial hierarchy, and offers a plan for efficient growth for the future. Generally speaking, 5 basic elements can be contained to create the blueprint for how your company is laid out, and decide how your managerial clerk goes about effecting change in your organization. First and foremost, the first element is names of managers and employees. If a manager can call out one employee's name when they come across, the employee will feel that he is respected and valued. Then the second element is title, which is necessary for showing the hierarchical relationship. It helps to demonstrate each employee's direct manager and the manager's subordinates clearly. Since an organization is a big team consists of many small teams, the name of department is often displayed. It tells how many departments/divisions there are, which department is each member from. The next element is contact information, including telephone and email address. If a more simplified org chart is required, this element can be omitted. Last but not least, each member's photo may be inserted, giving full play to the chart's visualization role. It is definitely the simplest and fastest way to get acquainted with co-workers without limitations of time and location. The "layout" means how the subordinate levels in the hierarchy branch out from top to bottom or from left to right. Generally, vertical layout can save more room. Probably one wants all subordinates flushed to the left, hanging to the right, or distributed evenly across a horizontal plane. Edraw offers 10 layout styles. Only one click change the whole diagram's arrangement at once. You will learn more about how this works in How to Create an Organizational Chart. There are many kinds of software available for organization chart creation such as Visio and Edraw. You can download Edraw to try it free. After experiencing Edraw's fun and fast drawing solutions, you won't go back to Visio again. Find out why Edraw is the best replacement of Visio here. Edraw Organizational Chart Creator is the best organigram diagramming tool to create your organizational chart. You can even add images to make a photo organizational chart! There are 3 ways available for making an organizational chart in Edraw. You can start from a blank organizational chart or import data directly. The fastest and easiest way is to make use of the templates. To make your chart more professional and polished, go to Top Tips to Make Org Charts Work for reference. Also, we've created video tutorials to help you get started instantly: Video Tutorial - How to Create an Org Chart, Create an Org Chart with Data, Learn to Layout Organizational Chart. A few minutes spent on these videos will surely save you tons of time in the long run. 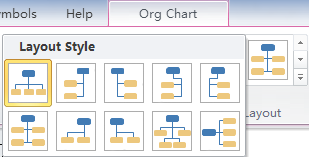 When you select one organization chart shape, the context menu pop up automatically, through which you can add subordinate, colleague or assistant. The org chart creator will auto-align, auto-space, and re-layout shapes. All are quick and easy. See more detailed guide about how to use these tools in Mind Map and Org Chart Tools. The following organizational chart templates include trading market organizational chart, service organization chart, service organizational chart and company organizational chart. Click the hyperlinks or pictures to view full version.